This book is currently available at my Create Space website and is also available through Amazon at the link below. This is a guide to over 1200 football stadiums in Texas. From the six-man football Cowboy Corral Stadium in Happy, Texas to AT&T Stadium in Arlington, this guide covers them all. Whether you plan on watching the Houston, Texans game with 60,000 of you closest friends at Reliant Stadium or sit on the hood of your pickup and watch the Longhorns play six-man football at Longhorn Field in Loop, Texas, we can tell you what you need to know. The cover photo was taken October 02, 2015 at the game between the Jacksonville Indians and the Corsicana Tigers at The Tomato Bowl in Jacksonville. 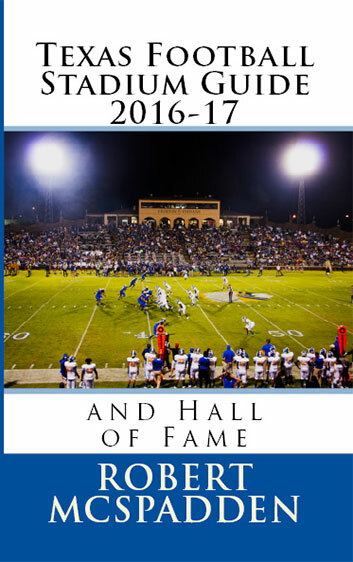 It was also the Jacksonville Homecoming game and the celebration of the 75th anniversary of the Tomato Bowl.